We offer school car park lights to provide a simple and cost effective method of walkway illumination. We often leave our cars in un-adopted areas, where it can be very dark. It is crucial to make sure these areas are properly illuminated in the evening. School car park lights offer a product designed around the use of solar power, this provides a method of lighting these areas. This uses battery storage derived from solar energy to power LED’s, for when illumination is needed if walking across uneven or rough ground. It is important to have suitable amount of light on walkway’s, in, and around the many schools and car parks across in the UK. This health and safety is paramount to the well being of anyone visiting a school after dark. It is essential to make sure that we have a clear path to follow. Examples of lights in car parks are like having a beacon to walk towards. This is to safeguard your passage to and from the area. We could say that in the distance there is a beacon, this light will allow me to walk in that direction without fear of tripping along the way. Any method of Illumination is designed to throw a pre designated amount of light over a specific area. Options to provide car parks and walkway illumination; with these sort of lights, it provides safe passage within a given circumference around the luminary. In many circumstances these are offered where normal lighting or mains power supplies are not available. For areas outside the scope of mains powered connections. This is where we can provide one of our DBS solar powered lights for schools car park and playground areas. School gates and steps, are also where potentially it could be susceptible to accidents after dark. So we offer lights for all situations which approach school areas and walkways. 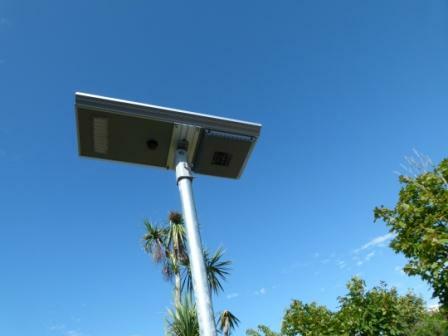 Our PV lights offer any for location across the UK. A solar powered light designed and manufactured to suit the request. We design solar school car park lights from north to the south of England; this is always based on our customers’ requirements. We ensure the performance of the solar panels can provide sufficient capacity, to deliver illumination for any school project using just the sun’s natural energy. So depending on what performance a school area needs, we can offer a product to match the latitude, multiplied by hours the luminary can perform during the shortest days in the winter period. School walkway lights designed for concrete steps in primary school in St David’s Pembrokeshire.